Forest fragmentation threatens biodiversity, often causing declines or local extinctions in a majority of species while enhancing the prospects of a few. A new study from the University of Illinois shows that parasites can play a pivotal role in the decline of species in fragmented forests. This is the first study to look at how forest fragmentation increases the burden of infectious parasites on animals already stressed by disturbances to their habitat. The study, of black-and-white colobus monkeys and red colobus monkeys in tropical forests in western Uganda, appears in the American Journal of Primatology. Once dominated by vast forests, Uganda now has less than one-twentieth of its original forest cover. According to the World Resources Institute, its tropical forests are being logged and converted to agricultural land at a rate that outpaces sub-Saharan Africa as a whole. Small tracts remain, however, hemmed in by pastures and croplands. Many of the species that thrived in the original forests are struggling to survive in these parcels, which can be as small as one hectare in size. Populations of black-and-white colobus monkeys appear to be stable in the Ugandan forest remnants, while their cousins, the red colobus monkeys, are in decline. Gillespie and his colleague, Colin Chapman, of McGill University in Montreal, surveyed 20 forest fragments near the western boundary of Kibale National Park, in western Uganda. They compared the abundance, variety and density of potentially harmful parasites in these fragments to the undisturbed “core forest” of the park. The researchers followed the monkeys for four years, collecting data on how far the animals ranged, what they ate and which parasites were infecting them. In those four years, red colobus populations in forest fragments declined 20 percent, whereas populations of black-and-white colobus monkeys remained relatively stable. Both species maintained stable populations in the undisturbed forest. Scientists have struggled to explain why closely related animals, like these two species of monkeys, can fare so differently in forest fragments. The answer, Gillespie said, lies in a complex interplay of factors, with parasites and nutrition playing key roles. The researchers focused on two nematodes known to cause significant pathology in monkeys: a whipworm, (Trichuris sp. ), and a nodule worm (Oesophagostomum sp.). While feeding on leaves, the monkeys ingest the larval forms of these worms. The larvae mature in the intestines, where they can cause blockages or other damage. The nematodes migrate through blood vessels, causing inflammation, organ damage and, sometimes, death. The researchers found a higher density of parasites in the forest fragments than in the undisturbed forest. They also found new parasites not seen in the undisturbed forest. “Several of the parasites in these animals in the fragments never occur in undisturbed forest, and some of these novel parasites are definitely from livestock or people,” Gillespie said. The red colobus monkeys were infected with five of these human or livestock parasites; the black and white colobus carried only two. Other differences between the two species affect their vulnerability to parasitic infection. Red colobus monkeys congregate and live in large groups, with up to 50 members, compared with about 10 members in the black-and-white groups. Red colobus monkeys eat a much more varied diet. This causes them to travel farther, searching for the foods they need. But many of the plants that make up their diet simply aren’t available in disturbed forest fragments. 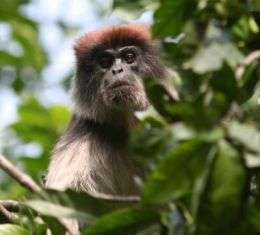 “The red colobus typically eat 40 to 50 species of plants, but in these forest fragments we might only have 12 tree species, so there’s a dramatic reduction in what we typically would see them feed on,” Gillespie said. The black-and-white colobus monkeys’ ability to eat well under a variety of circumstances enhances their ability to withstand parasitic infections, Gillespie said. Red colobus monkeys’ travels bring them into contact with more parasites. Their compromised nutritional status also weakens them, giving parasites the edge, Gillespie said.